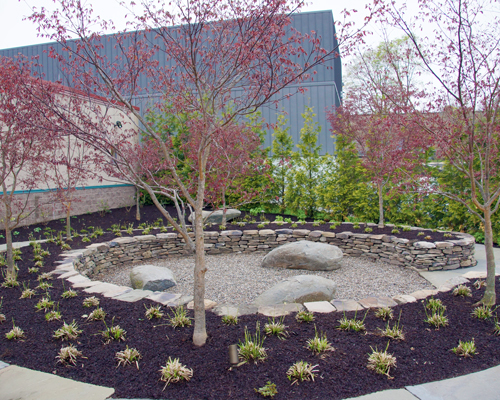 On Monday, April 30, the Doylestown Branch proudly opened its (back) doors to reveal The Backyard: a brand new, outdoor extension of the library. Once a grassy knoll, The Backyard is now roughly 20,000 square-feet of hardscaped paths and seating, including a fire pit, fountain, wind harp, and laurel maze, surrounded by a lush assortment of native plants and trees. Visitors can read, reflect, and commune in this fresh, natural, flexible environment. In addition, The Backyard will host dozens of programs for all ages designed to take advantage of the outdoors and encourage patrons to engage with nature and their environment. The Backyard will be open during branch hours as long as the weather permits. The innovative and inviting space was designed and constructed in partnership with Dear Garden Associates, and reflects a library-wide goal to leverage our outdoor spaces to expand our square footage. Planning is already underway to rehabilitate and improve outdoor spaces at several other branches. The Backyard is made possible by proceeds from a gift made by James Michener in 1996. As a result of appreciation and good investments, Bucks County Free Library has been privileged to use this gift toward various improvement projects throughout the years. Through creative thinking and leadership, as well as support from its Board of Supervisors, the Friends of the Doylestown Library and the community, Bucks County Free Library is excited to bring The Backyard to fruition. Previous Post: New Titles for Book Clubs in a Bag!